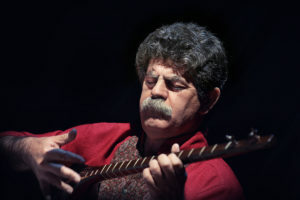 Ali Akbar Moradi “the best tanbour player alive” (songline Magazin, 26, 2004) was born in 1957 in Guran, not far from Kermanshah, the main city of Kermanshah province. He was encouraged by his grandfather and his father and started studying the tanbour at the age of seven. He was taught by Sayyed Hachem, Kafashyan, Alavi, Darvishi, Hamidi and Sayyed Vali Hosseyni with whom he learned not just his mastery of the instrument but also of the Kurdish maqam repertoire. He gave his first recital at the age of 14, in Kermanshah. One year later he founded the first tanbour group within the cultural department of the city. He began to tour in Iran. His fame increased as of 1981 through his collaboration with the singer Shahram Nazeri, performing in Europe, Canada and the United States. In 1991, he won first prize at the String Instrument Festival. Starting in 1992, he did research on the ancient maqam and recorded several cassettes. In 1998 he founded the Lavatch group, with whom he gave concerts and recorded a cassette. In October 2000, he gave a concert with his son Kourosh at the Royal Festival Hall in London, followed by numerous tours throughout the world and the publication of several CD's. In addition to his research and concerts, he teaches the tanbour in Teheran and Kermanshah. “I discovered the tanbour in 1964, due to chance and by the grace of God, when I was only seven years old. I felt that this instrument had a soul and that it spoke to me: its song cradled me and purified me with every passing day. My grandfather and my father gave me great encouragement in this vocation because, for the Yarsan, the initiation in the tanbour is a pious task. From the beginning they sent me to the greatest masters. Now, I must devote my life to it. Without it, my life would be just a series of dull and futile days. The tanbour is not just a musical instrument, it is the music of an ancient Iranian people and the symbol of its culture. AliAkbar currently resides in Kurdistan, Iran where he teaches tanbour and continues to develop the legacy of the instrument and the music. - Ali Akbar Moradi “THE RITUAL 72 MAQAMS OF YARSAN” (2003, Inedit) – 4 CD set.